Gwyneth Paltrow recently partnered with organic skincare line Juice Beauty to create her own outstanding goop skincare products. I love that these products come in travel-sized kits. The goop Discovery Set includes a day moisturizer, face oil, night cream, and exfoliating instant facial. Perfect for those moms who want to keep up their beauty routine while traveling or on the go. 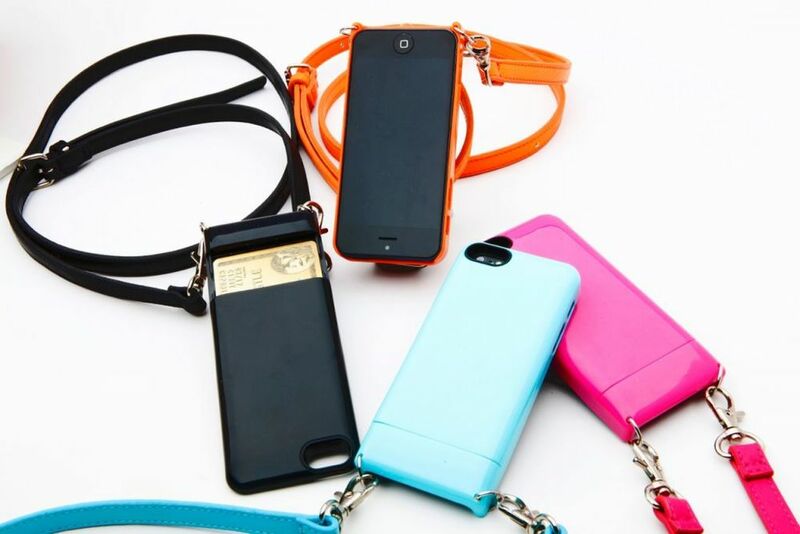 I adore these Bandolier iPhone carrying cases because they seamlessly blend style with function. With its patent pending design, each Bandolier case and strap features two slots to accommodate credit cards, driver’s license and/or cash for true liberation from the necessity of carrying a handbag while out and about. Created by a team of Hollywood insiders and veteran designers, Bandolier is the game-changing accessory that epitomizes the California ethos of tech meets fashion. Perfect for the mom who is addicted to looking at her phone! Sound familiar? Bonus: Use promo code FAN37 in shopping cart to receive a 15% discount. I carry mine like a cross-body bag for easy access to take photos, tweet, instagram, text and make calls. This spring, help the moms in your life say goodbye to boredom with their exercise routine and hello to variety with a gift certificate from ClassPass. This is a great gift for the aspiring yogi, inner cyclist, and moms who like to switch it up and try lots of different fitness classes. With the ability to attend over 7,000+ studios worldwide, think of ClassPass as the ultimate all-access exercise pass! If you would describe your mom as sophisticated and socially conscious, then she will LOVE these gold pavé diamond bar earrings by ASH + AMES. Featuring a simple shape in elegant 14K gold and a row of hand-cut pave diamonds, this will be a gift that mom will never want to take off! These elegant earrings are hand made by female artisans in India and can be worn from day to night. ASH + AMES is a wonderful company that supports female artisans globally, gives back to developing countries and inspires women to launch their own ASH + AMES businesses (selling the line via trunk shows). Learn more at www.ashandames.com. I love this stylish and classic leather tote by Cuyana and think mom will too! It's one of my fave every day bags this season and well priced for the look and quality! This super soft and lightweight tote bag is made from a classic pebbled Italian leather and can be personalized with mom's initials. Available in thirteen colors so you can select the perfect shade. This modern highly-styled teapot will make any mom excited to pour her next cup of Darjeeling. Mud Australia is a Sydney-based modern design company, specializing in durable dining and serving ware. They also make plates, mugs, bowls, and serving platters that come in a variety of colors that blend together beautifully. Mom will love receiving a personalized photo book created by Mosaic, an app that allows you to create them on your smartphone or tablet. Each book is a unique collection of photos presented beautifully and with great care from cover to cover. Each Mosaic is printed within 48 hours and arrives in four days. It's the perfect way to transfer wonderful life moments into a tangible, meaningful creation. Makes a fabulous gift for any mom--she will enjoy these captured memories forever! Perhaps you'd rather gift mom with a luxurious experience? A great solution and personal favorite is Soothe, the newest way to receive an in-home massage. Soothe brings 5-star massage therapists directly to your home, office, or hotel all in as little as an hour. With all therapists licensed, background-checked, and thoroughly vetted, Soothe is sure to offer mom a customized experience to meet her wellness and relaxation needs. With summer around the corner, it's nice to give mom a fresh look to rock at the beach or pool. This chic cover-up caftan by Tigerlily certainly fits the bill. Made of woven panels and sporting 3/4 sleeves, the soft, patterned crochet caftan is a seamless fusion of uptown fashion meets boho chic. It can also be worn as a top over skinny jeans! This personalized travel jewelry case by Mark and Graham will solve all of mom's jewelry transport needs. Gone are the days of spending what feels like days unstringing necklace chains and other jewels. Made of durable and flexible vegan material with a soft linen lining, these circular zippered cases feature multiple layers that will keep moms earrings, bracelets, necklaces, and rings safe and contained while traveling. Free monogramming is available.